This site serves as an archive for project AB0907, the "cincuenta taquerías" project, by Los Angeles architect James Black. 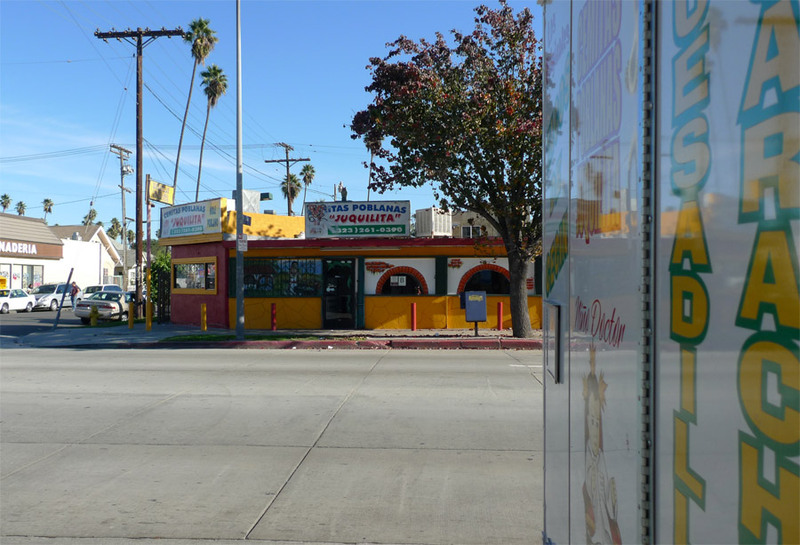 In 2010, James intends to visit a minimum of 50 taco shops in the Los Angeles area. Wherever available, he will sample the carne asada and al pastor tacos, photograph the tacos and the taquería, and record his impressions for posterity. Better than a mere New Year's Resolution, it is hoped that the experience will provide numerous benefits: an education in the finer distinctions of tacos; exposure to new and overlooked restaurants; a reason to practice photography; a compulsion to get out of the rut of eating at the same restaurants all the time; explorations of different and diverse parts of the city; new bicycle rides to taco destinations; a reason to plan an easy outing each week with a high probability of satisfaction; many delicious, inexpensive meals; and a way to make 2010 memorable. This site uses the "Minimalist" theme for Wordpress, designed by "techdesigns." The theme was modified and configured for this site by Carmen Cham. My coworker Diana offered a few suggestions for Eastside Mexican food. Diana has bona fide roots in the Mexican state of Puebla, so I took her recommendation of Pueblan specialist restaurant Cemitas Poblanas Juquilita seriously. Juquilita had a taco truck parked across the street, a classic signifier of Street Cred in this business. After reading a few reviews of Eastside Pueblan restaurants on Yelp! I learned that many offer an item called “tacos árabes,” which according to online speculation is a seasoned al pastor-style pork cut from a spit and served on a thick flour tortilla, and so called because this shawarma-inspired item was originated by Lebanese immigrants to Mexico. Sounds pretty good, Puebla, with your old-timey “fusion” cuisine. 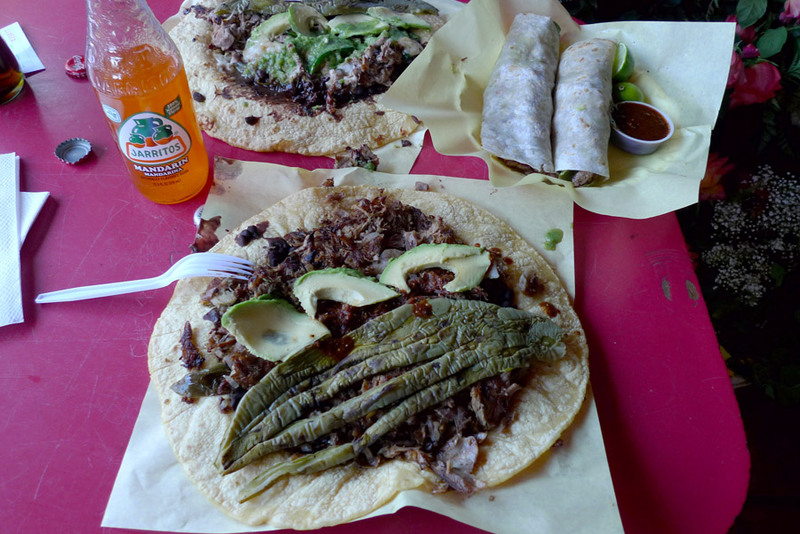 Carmen and I went to Juquilita today for lunch – only 15 minutes away by the freeway – and became overwhelmed by meat. We did not know how to order, and consequently ordered way the hell too much food. We saw no written menu, but only a series of photos with images of their items and names, and no prices listed. I ordered a taco with barbacoa (goat) and an arab taco, and Carmen ordered a taco ranchero with steak and an arab taco, and with two Mexican sodas the total was $28. That was the first sign that we had ordered too much food. We’ll be in leftovers for days. On this heaty 85-degree December day we found a table in the pleasant indoor-outdoor hybrid space out back, bounded by walls on three sides and a roof, and open to a compact and pigeon-filled parking lot. The enormous tacos arrived, bringing on an immediate sense of “scalefuck,” a term taught me by a professor in architecture school for the disorientation experienced when something appears grossly out of normal proportion. Look at the photo and see how the Jarritos bottle looks like a half-size miniature and the plastic fork looks like a pretend toy fork. Here I can be seen on the internet pretending to eat this taco like a taco, but in truth this is less a taco than an ENORMOUS meat plate that happens to have a giant handmade tortilla lining the plate. This “taco” makes the Grand Central Market taco look like a Yorkshire terrier. I was picking it up because I had eaten as much as humanly possible and was about to insert it into that undersized take-out container. Next time I go to a Pueblan restaurant, I will order with more care. The giant barbacoa taco you see in the picture, the one that looks like Zoidberg, featured a black bean slurry coat first, then several goats-worth of magical goat chunks, and topped with smoky red salsa (per my specification), avocado slices, and a big sliced paddle of chewy cactus. The goat was slow-cooked carnitas-style and had the same textural variation and delights as good carnitas, with blackened crispy bits contrasting with melt-in-your-mouth tender and juicy bits. The flavor is intense and gamy. I hardly made a dent in this bad boy and I have still been tasting goat all afternoon. In the background you see the plate with the two tacos árabes, which only look small because they appear next to the Gargantua and Pantagruel of tacos. They are really the size of small burritos, like the kind you get at Taco Bell or Del Taco. I had asked for pork and Carmen asked for beef, but we believe that they both came with the beef. Fine with me, because it was deliciousness from the first bite. The meat was cut into long thin strips and marinated in a profound and complex admixture of spices, familiar-seeming but not like anything I have encountered in a taco. I applied a measure of the chipotle-smoky red salsa and ate it like a burrito, and it was pure delicious within a pleasant flour tortilla. I look forward to visiting more Pueblan restaurants and trying more varieties of tacos árabes. The taco universe is ever-expanding, and the more of it I see, the farther away the taco horizon gets. Tacos arabes? Tacos Zoidberg? Scalefuck? Best review yet! Thanks, Tarik! Tacos Zoidberg to all, and to all a good night. That chewy cactus looks like the hand of an extraterrestrial alien! Did it taste good? I was laughing the whole time I read this review, you are an excellent writer. This blog is my new source for trustworthy taco reviews. The chewy cactus alien hand was not bad, and sort of good! It was pretty much alien to me as food, because I don’t think I’ve ever had anything like it before. The chewy texture reminded me of mushrooms. Tonight was the first time I have ever eaten taco leftovers. There was too much left over even for me and Carmen to finish. Now I’m feelin’ goaty.